Mitt Romney has tapped Wisconsin Rep. Paul Ryan to be his running mate, multiple sources with knowledge of the decision told Fox News. Romney will make the selection official during a campaign stop Saturday morning in Norfolk, Va., before launching his “The Romney Plan For A Stronger Middle Class” bus tour. Romney is expected to speak at 8:45 a.m. ET. Paul Davis Ryan (born January 29, 1970) is the U.S. Representative for Wisconsin’s 1st congressional district, serving since 1999. He is a member of the Republican Party, and is often cited for his views on economic policy and especially his proposed changes to Medicare. Ryan has long been considered a possible vice presidential running mate for the 2012 presumptive Republican presidential nominee, Mitt Romney, with reports surfacing on August 10, 2012 that Romney had selected Ryan. 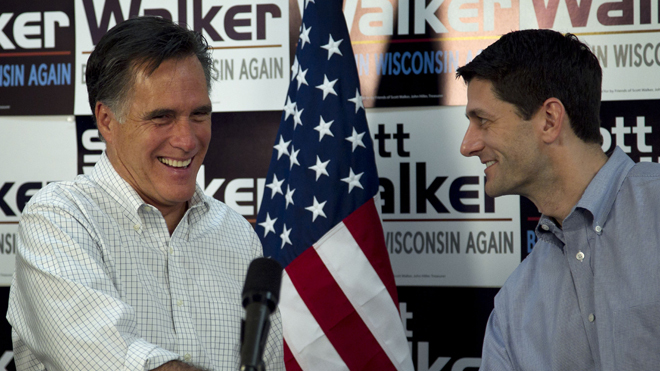 Born and raised in Janesville, Wisconsin, Ryan earned a B.A. degree in economics and political science from Miami University in Ohio. In the mid to late 1990s, he worked as an aide to United States Senator Bob Kasten, as legislative director for Senator Sam Brownback of Kansas, and as a speechwriter for former U.S. Representative and 1996 Republican vice presidential nominee Jack Kemp of New York. In 1998, Ryan won election to the United States House of Representatives, succeeding the two-term incumbent, fellow Republican Mark Neumann. He is now in his seventh term. Ryan currently chairs the House Budget Committee, where he has played a prominent role in drafting and promoting the Republican Party’s long-term budget proposals. As an alternative to the 2012 budget proposal of President Barack Obama, Ryan introduced a plan, The Path to Prosperity in April 2011 which included controversial changes to Medicare. He then helped introduce The Path to Prosperity: A Blueprint for American Renewal in March 2012, in response to Obama’s 2013 budget. Ryan is one of the three co-founders of the Young Guns Program, an electoral recruitment and campaign effort by House Republicans. See Wikipedia for entire article.